Largehearted Boy: Book Notes - B.J. Hollars "This Is Only a Test"
Book Notes - B.J. Hollars "This Is Only a Test"
B.J. 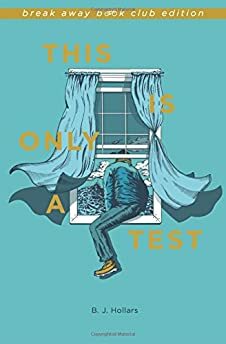 Hollars' collection This Is Only a Test is filled with moving essays of disasters from a distinctly human perspective. "The thread that binds these essays on death and mayhem is the author's love for his children and wife, which offers readers a respite from the inherent grief and devastation he poetically describes." It's difficult to select a soundtrack for disasters, mostly because disasters are experiences we'd just as soon forget. Yet to some extent, my essay collection, This Is Only a Test, serves as proof that disasters can never be fully forgotten; they remain with us, rattling back into our lives at unexpected moments. My collection attempts to capture the aftershocks of disasters, to help readers understand that for victims, the trauma never ends—it merely changes forms. After a tornado struck my town of Tuscaloosa, Alabama, I immediately took to my computer. I began with a single line—I am trying to write my way out of disaster—and soon found myself repeating that line again and again, cluttering pages with my mindless repetition. Eventually, this line became the collection's refrain, though no matter how many times I tried to "write my way out" of tornadoes, drownings, bombings, and the perils of parenthood, the more I realized just how powerless my words really were. Indeed, I could control the letters on the page, but very little beyond that. Simply put, writing these essays was a lesson in humility; a reminder that essays are only temporary shelters. At some point the words run out and we're forced to face the day. In the book's opening essay, my wife and I are huddled in a bathtub, waiting for a tornado to pass. We'd just learned that we were pregnant, and as we crouched in that tub, dark thoughts began to emerge. What if we die here? we wondered. And if so, what about the unborn person who will die with us? Drive-By Truckers' "Two Daughters and a Beautiful Wife" captures our contemplation by recounting the story of a man at the gates of Heaven. "Memories replay before him," Jason Isbell sings, "All the tiny moments of his life / Laying round in bed on a Saturday morning / Two daughters and a beautiful wife…"
Later, when I first heard this song, I thought of all the Saturday morning we might've lost had the tornado's trajectory moved a little to the left. The high synths of Radiohead's "Everything In its Right Place" immediately reminds me of the piercing squalls of the Emergency Alert System warnings we've all heard broadcast from our TVs and radios. Even today—five years removed from that tornado—every time I hear that squall (or this song) I can't help but think of Tuscaloosa. A few weeks following the tornado, a grocery clerk in Tuscaloosa wished my wife a happy mother's day. "Are you a mother?" the clerk inquired. She wasn't—not yet—though the baby was growing inside of her. We hadn't told anyone, and yet this store clerk—so perceptive, or so bold—seemed to know our secret. I witnessed their encounter from the opposite end of the cereal aisle, and since I was in earshot, I heard my wife's reply: "No," she said, "I'm not a mother. But maybe one day." As we pushed our cart into the parking lot 15 minutes later, Cat Steven's "The Wind" infiltrated my ears. Steven's simple plucks of the guitar, coupled with his edging-toward-optimistic lyrics—"I listen to the wind, to the wind of my soul…"—helped us begin to see our lives through a future lens rather than the destruction of the recent past. A month after the tornado struck we left Tuscaloosa for good. We moved to Eau Claire, Wisconsin, where a job awaited me. Months passed, my wife's body expanded, and our son's due date came and went. My wife's frustration grew along with the extended time line, and with each passing day, she concocted new way to will herself into labor. Those final days were interminable, and since I had no physical trials ahead, I tried to remain calm for us both. "Steady, steady, steady…" The Staves remind, the trio of female voices serving as a near-perfect soundtrack for that moment. When confronting a fear, I empower myself by learning all I can of it. It's as if I think that if I read enough about it, I might diminish its power. This diluted thinking is what led me to this essay—a fragmented listing of drowning facts told in 45 brief sections. The sections eventually circle back, but in the time between, readers are left wondering how the pieces fit together. It can make for a complex reading experience, and admittedly, one that likely prompts half of my readers to hurl the book across the room. But if one sticks with it, I like to think the essay's logic begins to emerge; at first I try to showcase the beauty of complexity, though by essay's end, I aim for the beauty of simplicity, too. I know of no song that better captures the raw, emotional power of simplicity better than Thomas Newman's hauntingly composed "American Beauty." In these linked essays—both of which describe encounters experienced at summer camp—it's only fitting that they share a song. "Linger" has no single artist, but instead, is a song that's been sung around campfires for decades (and probably much longer than that). Like any good campfire tale, I'm uncertain of the song's origin, but as someone who has sang it around hundreds of campfires (first as a camper, later as a counselor), I know all too well of the song's remarkable power. As any former camper knows, the beauty of summer camp resides in its evanescent nature. You get there, you make friends, and then, within a week or so, you go home kicking and screaming. There's no better way to say goodbye to the experience than to acknowledge what's being lost. On the last night of summer camp, tradition dictates that campers sit around the campfire, sling arms around their friends, and sing: "Oooo, I want to linger / Oooo, a little longer / Oooo, a little longer here with you…"
These essays attempt to capture that magic, to offer a few more stanzas to that song. A friend once referred to the first year of parenthood as "the year of the great forgetting." He told me that I'd love every second of it, but that I wouldn't remember a thing. Indeed, sleep deprivation would leave a hazy cloud over my son's first year of life, but I was surprised to find that this haziness continued into his second year, too; that is, until a never-ending low-grade fever suddenly put me on high alert. It's only natural to feel helpless in the face of natural disasters, but there's nothing natural about feeling helpless about disasters that effect the people you love. Let me try again. What I mean to say is: of course you feel helpless when your son has a continual low-grade fever you just can't shake, yet despite all you can't do, there's always a lingering feeling that there must be something you can do. You beg the universe for answers. You plead for a chance to do something. Last summer I heard Sufjan Stevens' sing "Fourth of July" at an outdoor concert a few miles from my home. There, on a warm July night, the speakers trembled as Stevens' repeated his own line again and again: "We're all gonna die." It was a dark message, sure, but there was also some light in it. We all are going to die, after all, but our helplessness—at least related to mortality—can sometimes be our comfort. Sleep deprivation can effect a person in a number of ways, including one's sense of humor. When I wrote "Punchline", I tried desperately to explain a joke that only really makes sense if you're a sleep-deprived couple with a young child. Trying to expand the joke to a wider audience was all but impossible, but I think—I hope!—that by sharing a joke that could never successfully be shared, I highlighted something about the nature of our relationship. "Tracks of My Tears" gets at that same idea of the intimacy of laughter. "Although I might be laughing loud and hearty," Smokey Robinson wails. "Deep inside I'm blue…"
In the closing essay, I'm faced with another "crisis" of parenthood: an ultrasound that only ever shows half the picture. My wife endured one ultrasound after another, but each time, the tech could only see a portion of our daughter. What part can't we see? we wondered. What part of our daughter is missing? Throughout the coldest nights of winter, I'd walk home after my evening classes with S. Carey blaring in my ears. S. Carey and I share a town, and I took comfort in knowing that he was singing of a landscape we both knew well. As I trekked up the snow-capped hill, crossed the empty street, and wandered back to the house with the light on, the lyrics to "Crown the Pines" always resonated: "I am in love with this place / But I fear for its grace…"
Directly following the final ultrasound (which revealed our daughter in good health), my wife and I drove to the local record store to pick up an autographed copy of S. Carey's "Range on Light". Every time I spin it now, I think of one word: gratitude.